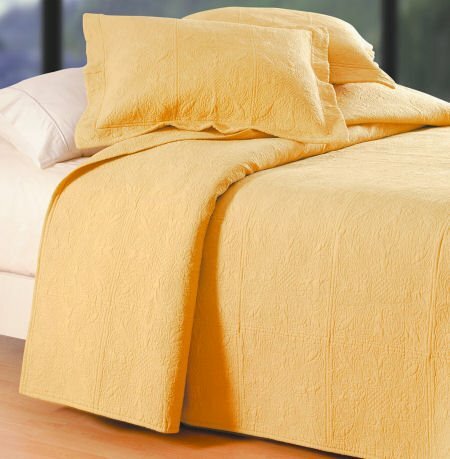 If you are looking for solid color bedding, you will love these quilts and accessories. These ensemble is in a rich shade of golden Cornsilk yellow. Use them by themselves or as a coordinate with one of our beautiful print quilts. Intricate quilting gives the look of fine matelasse. 100% cotton face, cotton filled, prewashed. 66" x 86" twin quilt. Intricate quilting with the look of fine matelasse to layer or accent or use on its own. 100% cotton face, cotton filled, prewashed. By C & F Enterprises. Allow approx. 3 weeks delivery on this item. We offer all of the items in the Quilted Matelasse collection. 90" x 92" full/queen quilt. Intricate quilting with the look of fine matelasse to layer or accent or use on its own. 100% cotton face, cotton filled, prewashed. By C & F Enterprises. Allow approx. 3 weeks delivery on this item. We offer all of the items in the Quilted Matelasse collection. 108" x 92" king quilt. Intricate quilting with the look of fine matelasse to layer or accent or use on its own. 100% cotton face, cotton filled, prewashed. By C & F Enterprises. Allow approx. 3 weeks delivery on this item. We offer all of the items in the Quilted Matelasse collection. 26" x 26" euro sham. Intricate quilting with the look of fine matelasse to layer or accent or use on its own. 100% cotton face, cotton filled, prewashed. By C & F Enterprises. Designed to be used behind standard sham. Allow approx. 3 weeks delivery on this item. We offer all of the items in the Quilted Matelasse collection.